Not sure anyone from Seattle even reads this forum, but I'm going to the Seattle area for Vets Day weekend. Day 1: drive to the university area, Discovery Park, Ballard, and Fremont. Spend the night in Downtown Bellevue (I've heard good things). Day 2: go to the Bellevue Botanical Gardens, drive to Tacoma and explore the Downtown, drive to Olympia and check out the Downtown and town in general. Get to Bremerton by mid-afternoon, check in and take the ferry to Downtown Seattle for the evening. Day 3: check out Port Townsend, drive to the ocean (I want to at least see it), hit Hurricane Ridge, visit the winery near PA. Spend the night in Port Angeles. Day 4: take the ferry to Victoria. Spend the evening and night in Port Angeles. Day 5: plane departs at 2pm, so I have time to kill. I plan to spend more time in whatever town I liked. Any other suggestions for urbanism in the Seattle suburbs? I've been told about Kierland. Any other spectacular CBDs that I'm missing? Day 1: be sure to get out of your car and walk the UW campus and Fremont. Green Lake is worth a look too. Downtown Bellevue is becoming a shopping mecca on par with Seattle and other major cities. With all the construction going on, it should be fun to check out. Day 2: Be sure to check out the university and museum area in downtown Tacoma. See the pics I took monday here. There is free one hour parking on Jefferson St. by UWT. Tacoma also has some cool neighborhoods. I'd drive around NW Tacoma if you have a chance. North of downtown is Stadium High School (worth a look) and Tacoma's densest neighborhood. Along the bay is are parks, a walking trail and restuarants. Old Tacoma and Proctor Dist. are great neighborhoods. Point Defiance Park in the NW corner of the city is quite impressive and at least worth a drive through. Between Tacoma and Olympia, it might be more scenic to drive through Steilacoom (pronounced still-a-sprite) along the sound. What I would do is get on Bridegeport Way and head south to Chambers Creek Rd. and then along the sound into scenic, historitc Steilacoom. From there, catch the Dupont-Steilacoom Rd to get back to I-5 in DuPont. I'd totally mapquest this route because of the turns. In Olympia, I'd check out the capitol campus and then head downtown. Downtown there is a waterfront boardwalk if the weather is nice. Day 3: I would skip the ocean. It is too far away and would take too much of your time. Port Townsend is great. As for the suburbs, Kirkland is nice down by the lake. Instead of the suburbs, I'd focus more time in the city and hit West Seattle, Capitol Hill, and some the cool neighborhoods. I've actually heard such good things about Tacoma that I definitely want to check it out. I had actually originally wanted to spend a night there, but couldn't find a hotel close to Downtown for under $100. It seems strange to me because they're about the same as Downtown Seattle. Those pictures definitely make me want to check the city out though. Thanks for that route though. I always have to take every back road I can if I'm not in a hurry, and I was planning on buying a more detailed Washington atlas (Benchmark) to see some of the more back roads. I'll be sure to keep those with me though so that I can stay the hell off the 5 and actually enjoy the drives down. So there's really not much else in Olympia? I had it pegged as a really cool place, maybe like a Flagstaff. But from what I've read and heard, it sounds like it's just the capitol and a bit of the Downtown. Well, living in the desert you really start to appreciate natural bodies of water, and I miss the ocean. I've also never seen the actual Pacific in Washington, and I have almost all of Day 3 to get out there, so I'd really like to do it. If you think of anything else, definitely let me know. Here's another back route that goes from between southern Seattle and downtown Tacoma: take Marine View Drive from downtown Des Moines south, loop up to 16th, head south down 16th to 272nd, head west along Redondo Beach. When you are going up the hill away from the water, look for the to 509 signs and head south on 509. It will take you straight into downtown Tacoma just south of the museum area. Be sure to follow the signs on 509 because it takes a right hand turn in Federal Way instead of heading straight that can be easily missed. Des Moines, Redondo Beach, and the drive around Dash and Browns Points are great. There are also a couple of state parks along Puget Sound along that route. The best place to view the sound though is along Redondo Beach. The sound will be feet away from your car. During storms, this is a great place to watch crashing waves. As for Olympia, it is nice, but spread out and not touristy. Downtown is o.k. There is a decent nightlife, good restaurants, parks, boardwalk, and market district. The main shopping area is on the west side of town and is just your average mall, big box fare you would expect to find in a town a couple hundred thousand people. Olympia is more of those places you want to live than visit with its pleasant neighborhoods, plethora of bays, inlets, coves, rivers, and lakes, great schools, nice parks, not far away from Tacoma, Seattle, Portland, Olympics, Mts, ocean, etc. Olympia is a small town that is a afraid to get big, hence neighbor Lacey eventually catching and passing Olympia in population and highrises. As for seeing the ocean, it will be tough to do Pt. Townsend, Hurricane Ridge, and Port Angeles let alone spending another half day to see the ocean that will probably fogged up. 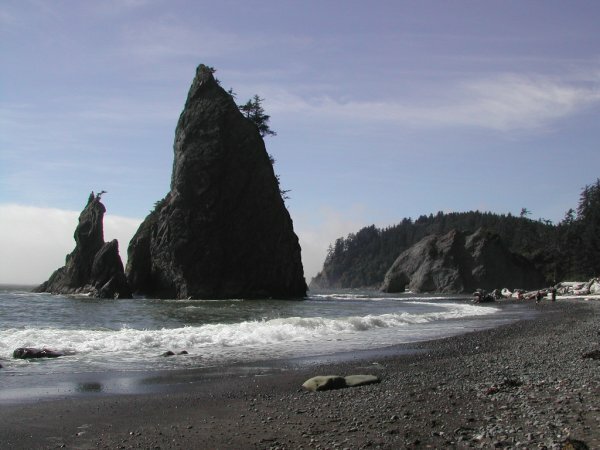 If you must see the ocean, go to Shi Shi Beach (pronounced shy shy) which is accessed through the Makah Indian Reservation in the NW corner of the state. There is a museum in Neah Bay worth checking out if your are into abororignal culture, etc. So I went out today and bought a good Washington State atlas (what I should have done originally). After looking at it, I've come to the conclusion that going to Victoria and therefore spending 2 nights in Port Angeles is probably not the best way to do it. Especially since I want to see the Pacific. It's just all too ambitious and would rush me. My new plan is to spend one night in PA, but then keep driving west to the ocean and spend the next night in Ocean Shores (very cheap hotels right now). That way, I can hit Hurricane Ridge that next day and be able to spend more time in Port Townsend the day before, but also hit more weird side roads along the way (what I really enjoy doing). Any opinions on Ocean Shores? What about Aberdeen? It would be nice to visit it since it's Kurt Cobain's hometown. Any other towns or sights along the route? Ocean Shores isn't that special. It is a flat spit of land that juts out between Grays Harbor and the ocean. It is however the most developed ocean community in the state, so plenty of stores, hotels, etc. The best place to check out the ocean is the stretch of 101 that runs along the ocean through the Olympic N.P. north of Kalaloch. Ruby Beach and Beach #4 are right off of 101 and worth a look. Aberdeen isn't that special either, in fact it is a dump. Pretty depressing this time of year. From Forks south, it is rainforest country and this is the rainy season. Victoria and Sequim however are dry; protected by the mountain rainshadow. Victoria is a must see! Again, I'd skip the ocean for Victoria. Ocean Shores, Aberdeen, etc. is too far out of the way and not worth your time. Also you probably don't need too much time in Port Townsend or Port Angeles; they are small places. Also, Hurricane Ridge might be clouded in, and not worth the trek. I'd watch the weather reports and make a gameday decision there. Well, now I'm excited about the Hoh Rainforest as well after reading up on it, so that's a must on this trip. Will anything even be open in Ocean Shores at this time of year though? I want to stay there only because I'd like to be able to spend a night on the ocean. Victoria will just have to wait until next time, unfortunately. Another deciding factor was that I would still be paying for the car but it would just be sitting in a parking lot for a full day. I'd rather use it and drive around more. Thanks again for your help. Any other suggestions for stuff to see along the way would certainly be appreciated. My friend has already vehemently insisted that I visit the glass museum in Tacoma. I would second that regarding the glass museum. You wont regret it. The Washington coast is nothing special between the Queets River and Chehalis Head. I bet the Ocean Shores Chamber of Commerce would disagree!! Those pictures are gorgeous. And I'm definitely spending time along that beach. No, I do understand the weather situation and that I picked an awful time to visit the Pacific NW, but it was actually deliberate as I'm considering moving there in several years (because the Seattle area just doesn't have enough programmers) and, since the weather was so gorgeous the last time I was there in September, I'm looking for the worst that Washington can dish out to try and make me stay away. If I did go to Victoria, I'd want to at least spend one night so that I could see more stuff, and maybe even drive up the island a little bit (something I've been told is a great thing to do). But it's just not looking feasible on this trip. I've found that it's better to totally avoid cool cities than to hit them and not have enough time to really enjoy it, which is why I haven't been to Vancouver in several years and am not going on this trip. I'm not the typical tourist in my destination choices (my goal trip right now is Newfoundland) and I've wanted to see the Olympic Peninsula basically all my life. Plus, the less people the better, I say, and I have a feeling that no one will be out there. I will be back though, of course, most likely next summer, so I'll have this whole thing out of my system and may go to Victoria then. Any knowledge of the Moclips Highway? Looks interesting! ^ the road between Ocean Shores and Moclips is o.k. It is the longest ocean front drive in the state, but the geography is less interesting than the places north (and south for that matter). It does have houses, stores, hotels, and other civilization unlike the protected coast to the north. If your dream is to ever live by the ocean in this state, this area is one of your few options. The steretch of 101 between Ruby Beach and Kalaloch is the best ocean drive. Kalaloch is also the best place to stay by the ocean, but it isn't cheap. I never have tried to stay there during the rainy season, so maybe it is cheaper. What atlas did you buy btw? I looked up the Kalaloch lodge and it's going for about $100 the night I'm there. A little pricey. It's probably higher on weekends and even higher than that during the summer. It does look like a great place to stay though. Benchmark. I have their AZ and NM editions and have always found them to be very accurate (especially for back roads, which is important in AZ) and easy to read, with some pretty obscure points of interest. I love benchmark maps. 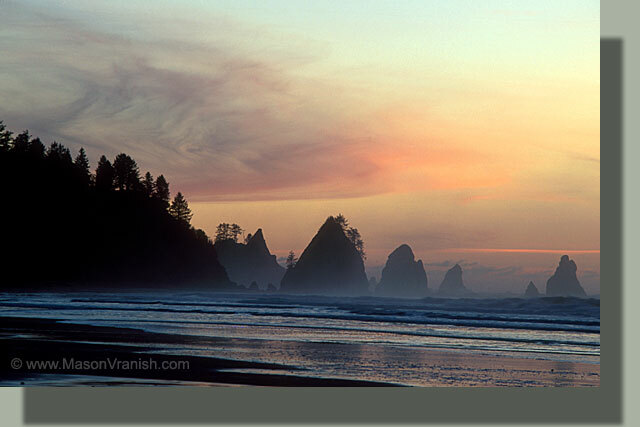 The Washington one is excellent and even pinpoints many of the great beaches and seastacks along the coast. You will have fun exploring with that. I also have the OR, CA, & AZ ones too. DeLorme maps are nice too but I personally prefer the Benchmark ones. They are also a NW company too, so it is nice to support them. You said it! I've had a great time exploring the Southwest with the Benchmark maps. It would be nice if I had a better vehicle there and could get on the more obscure, backwoods roads. But I just wouldn't trust a rental car or myself not knowing the terrain very well. Although, I don't know that I could anyway right now. I certainly didn't pick the best long weekend for this trip: flooding, levees being topped, 6" in 24 hours, evacuations. It's also predicted to be raining the whole time I'm there with highs and lows in the 40's. I guess it could be worse: it could be snowing or icy. I'm buying new boots today as well because my "waterproof" ones are full of holes and are anything but. But I'm still excited about this. I think you're coming up at the right time, Colin. I love the rain and the short days and long nights. I think the northwest is best appreciated in the rainy months. One of the most amazingly beautiful sights I have ever seen was Crescent Lake in a hard drizzle on a misty afternoon. Just wanted to emphasize that I had a great time on my trip. I made it to all of my anticipated destinations except for the Hoh Rainforest because the road in has been washed out and was closed (although I did get to another rainforest area by Lake Quinault) and the road to Hurricane Ridge was closed due to snow (although I had a great time at Heart of the Hills just below the snow line). The relative lack of crowds, cool starkness and general winter vibe makes me think that November is actually a great time to go. Bellevue was very cool with all of the construction but I didn't like how so many chains were there and how the older part of Downtown (Old Town, I guess) seemed to be much less active. Tacoma was gorgeous and I was really impressed with how nice a town it was. On the day of my flight, I actually drove up Pacific Avenue all the way from 512 to Downtown. I didn't really see these bad sections that I've heard exist in the town. And I drove around the area closer to the bay, which was awesome. I really liked Olympia and the Downtown area had to have the most bars I've seen in one area. It seemed like each block had one. Port Townsend was also gorgeous, although it's a little touristy for my liking. Port Angeles was a really nice, friendly town. I don't know why people say it's so dull. I liked that it was by the water, had some cool bars and restaurants and was close to quite a few sights in the area. Ocean Shores the town was nothing special but I loved the beach there and I had an oceanview room. The rest of the beach was great as well. I hiked down to 'Beach 4' and had at least a mile of coastline to myself, which was pretty amazing to me. There was some sort of strange foam issue here though that maybe someone can explain to me. Aberdeen was really cool and I actually wish I had spent more time there. They have a big public art project going on where the buildings are painted with colorful animal murals and the alleys have murals on them as well. Great pics! I am glad you enjoyed your trip. Our recent weather is about as bad as it gets, except of course the once in 50 year ice storms, so if you could handle it, you could handle Western Washington living just fine. As for the bad parts in Tacoma, you went pretty near them. The southern end is the least desireable part of town. Consider this is a relative thing and bad up here is nowhere near as bad as elsewhere. Thankfully the area is on the up swing somewhat. I am glad you liked Olympia. Many people don't. Did you check out any of the bars? The Vault was once my bank. I didn't see any pics of Tumwater Falls, so I am assuming you missed that. With the recent record rain, the falls are quite the attraction. I will post some pics later. Aberdeen is kinda cool, because of all the old buildings. It once was one of the largest population centers in the state. The place is pretty depressing now and has been for over 15 years. It was so heavily timber orientated the place crashed hard. If they can ever get their port up to snuff and diversify their economy, the place has lots of potential. My gf lives right over that bridge in Gig Harbor!